Mee Siam is a traditional soup noodle found in Southeast Asia that is very popular because of its complex flavors. The beauty of this dish is in its rich flavors – sweet, spicy and sour all in one – to match with the simplicity of its ingredients. Using only rice vermicelli noodles soaked in light gravy topped off with a few simple garnishes, it is a bowl of unadorned good food. 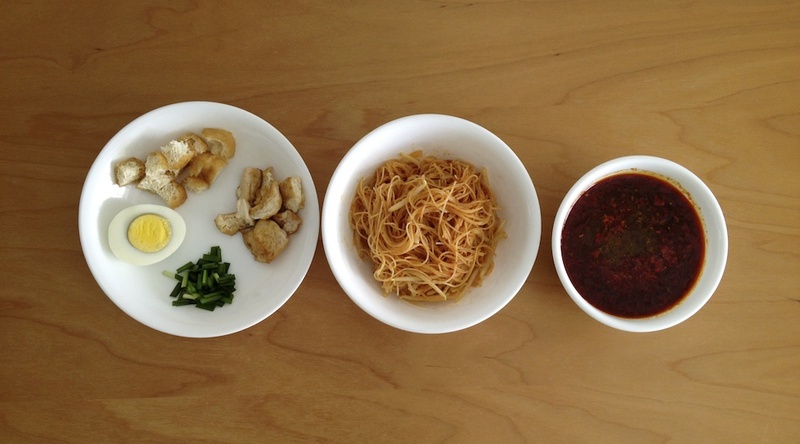 Mee Siam can be served dry or with soup, both ways are commonly found in Singapore. I will be sharing the soup version below because it is my family’s preferred way of eating this dish. Although it is more complicated to make, I guarantee that it worth the effort to master that tangy gravy. While I was furiously scribbling and taking pictures of my mum cooking, I got a bit frustrated because there is a lot of estimation involved. She was always shoving me a spoonful of gravy and telling me to try it. And I realized that a delicious bowl of mee siam is more than precise measurements. Rather, it is about adjusting it to your own taste and needs. If you like it sweeter, add more sugar. If you want it sourer, add more tamarind. The main takeaway message is: TASTE and TEST your gravy. This week’s post will be another fiery and pungent condiment that is a must-have on many Singaporean and Malaysian dining tables. 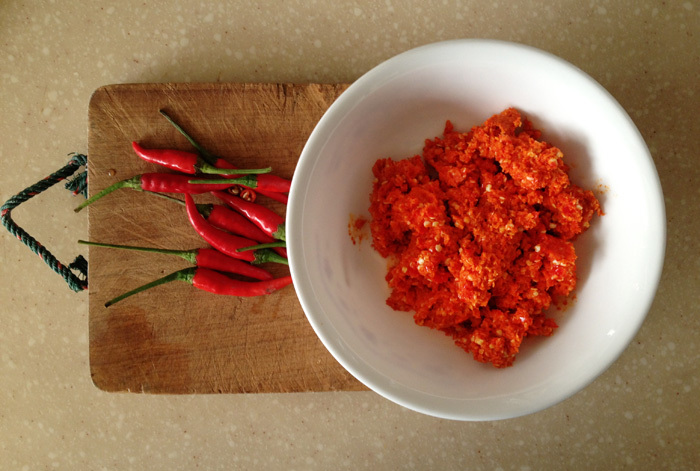 Sambal is a chili-based sauce combined with belacan, a fermented shrimp paste, to give this dish its unique, one-of-a-kind taste and flavor. I have grown up eating my mum’s homemade sambal belacan, which we use on its own as a condiment or as a basic ingredient to make signature local dishes such as laksa and curry chicken. Its popularity could be accrued to its versatility and also the depth and complexities in its taste. On first bite, the overwhelming spiciness from the Thai bird’s eye chili or chili padi (see picture above) as it is known locally will set your mouth on fire. It will be followed by an intense shrimp taste that could be a hit or miss because of the belacan’s strong odor. Combine both and they nicely complement each other to bring out the spiciness without the rawness with a smoky punch to it. Everyone loves a great chicken wing particularly during summer at barbeques, get-togethers and over a pint of beer. The best accompaniment during the sizzling hot days in my opinion. It is also a versatile ingredient that could be grilled, baked, pan-fried or deep-fried marinated sweet, savory or whatever mishmash taste you could think of. In Southeast Asia, we prefer them spicy and strong to tickle our taste buds where every mouthful will burst into a myriad of scrumptious flavors. 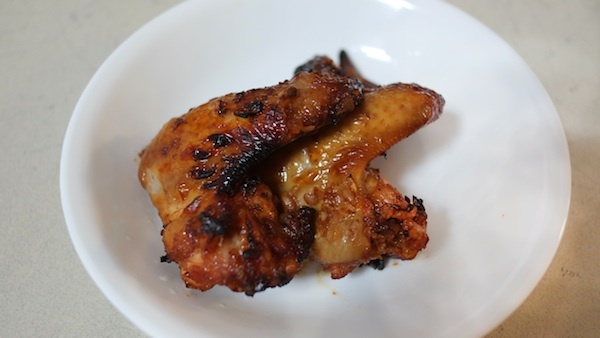 So today, I would like to share our family recipe for hot peppery chicken wings that we absolutely dig. To whet out appetite, the garlicky spicy smell wafting out of the kitchen when the wings are cooked is out of this world. When we sink our teeth into the meat, there is extra crisp from the onions and garlic. We typically use a turbo broiler to brown and crisp our wings to perfection, but you could also grill or bake it in the oven. If you love your spices or crave for an extra oomph in your dishes, this recipe will not fail to impress. Making pandan chiffon cake is an art in itself. My mum uses the same recipe, same mould and same ingredients for the past 20 years, but every time the results would vary wildly. Baking it is almost like playing Russian roulette, sometimes it would rise gloriously to the occasion but at other times, it will end with my mum wailing about the failed product. 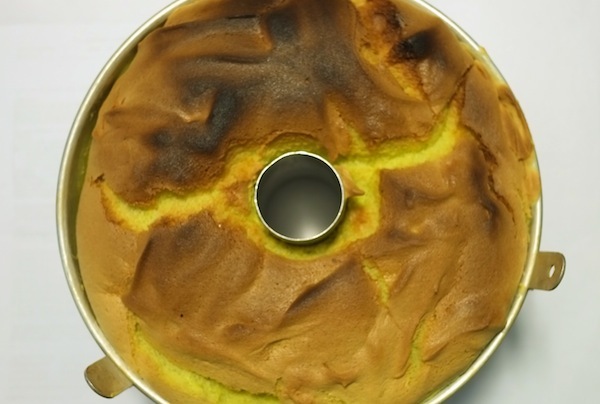 But this chiffon cake remains a favorite amongst most of my family members because it is light, fluffy and most importantly, the smell is absolutely divine, thanks to the pandan leaves, which also gives it its unique color. Pandan is a bush-like plant typically found in Southeast Asia that spots a bright green color and a distinctive smell that is believed to help deter pests like cockroaches. The plant is widely used in local cooking to help enhance the taste of the food, though never directly consumed. In this post, I am sharing my mum’s trustworthy recipe she has been using throughout all these years. You will need a chiffon cake mould for this. Despite the simplicity of ingredients, pandan cake is tricky to make because it is so light inside that makes the cake structure delicate and difficult to stand tall. Curries taste vastly different depending on where you are having them and in Southeast Asia, we like it spicy and flavorful. In my family, we are used to handling it real hot and this might potentially sound crazy but eating spicy food does help to cool you down amidst the heat and intense humidity. – during breakfast as a dip, as a soup base with noodles for lunch or as a main dish with rice for dinner. You get it. 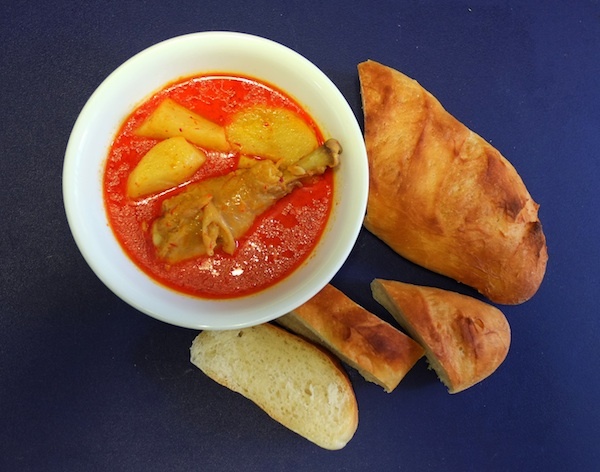 Curry is THAT deeply ingrained into our national food psyche.